There was so much to love about our trip to Canada last month but the little town of Banff really topped it for me. I love me a quaint little town. All of the craftsman houses that lined the crisscrossing streets, which were named after woodland creatures made me want to open an ice cream shop and call myself a local. Banff Ave and Bear St is where you would find most of the restaurants, shops, and coffee houses but that’s not all there is to Banff. One of my favorite places of the entire trip, I almost missed out on. I really wanted to get back to town, sit at a coffee shop and get to writing after an already long day of exploring. (There’s something about traveling and being in a town no one knows you that really inspires me.) But with a little bit of peer pressure, and a toddle temper tantrum on my part, my sister and friend talked me into visiting Johnston Canyon. This short half mile walk to the lower falls was my bar the easiest “hike” we did the whole week, and not something to miss. We exited the highway just after the town of Banff and drove a few miles into the canyon. The drive itself was stunning and we were keeping our eyes pealed for wildlife the whole time. Once we got to the canyon we saw there is a whole little resort there. The little lodge and bungalows looked absolutely beautiful and I’d love to wake up right in the middle of the wilderness. Like I said earlier, we only went a half mile into the canyon to the lower falls. The upper falls is another mile in and it was starting to get dark and rain a little so we opted for the shorter route. We didn’t have time but one thing we were told was a must do was the hot springs. Banff has a hot springs just outside of town but a few locals told us it was more or less a glorified hot tub and they suggested us to head to Radium Hot Springs. This was more than an hour and a half south of Banff and we defiantly would have taken the trip if we had time in our schedule. My favorite part of the town was walking up and down Banff Ave., going in and out of all of the shops. We saved this for our last day and it was a great way to relax, veg out a little, and try some local food and treats. As you know from my Lake Louise travel guide, I have a love for good hotels. We didn’t stay at the Fairmont Banff Springs, mainly because I knew it was a little out of the way and we really wanted to be as close to town as possible, but we headed over there one day and it was just as stunning at the Chateau Lake Louise. We explored their grounds, got the famous hot chocolate at STOCK Food & Drink and even did a little shopping at Fernweh, a cute little shop at the hotel. This hotel is just as stunning as you could imagine a castle in the middle of the Rocky Mountains would be. It was pretty over cast while we were there so we couldn’t see the amazing views but just walking the amazing property was well worth the quick trip up to the hotel. Banff Ave Brewing Company – When there’s a local brewery in town, we have to try it out. We started with splitting their sampler to be able to try six of their home brewed beers. I opted for a pint of Head Smashed IPA and Michelle and Michelle opted for the We’re Jammin’ Apricot Rhubarb Ale. We split a soft pretzel and headed out. Definitely a good place for bar food. Block Kitchen + Bar – This was absolutely my favorite meal of the trip. We woke up on our last morning to a rainy and over cast day and were in desperate need of a little pick me up. Someone the night before told us about Block and told us it fills up quick but to wait because they have the best food in town. We were luck to grab the last table available in their small, maybe 10 table restaurant. We started with three tapas, Pig Duck and Fig Cretons, Pork Gyoza and Bao. As you can see the menu is definitely Asian inspired. We didn’t stop there. Because the appetizers were so good we each ordered a bowl of their special: Thai Curry Ramen. It. Was. Amazing. I am still craving it. If you’re in town, definitely stop by Block. Their small menu seems like it is constantly changing which is always a good sign of a fun chef. Pacini – After a week of hiking, these three Italian girls needed some good pasta in our lives. We grabbed a late dinner at Pacini in the Moose hotel mainly because of the outdoor firepits we saw as we drove by, but when it was raining and we had to sit inside, we were a little bummed. The food made up for the weather though. There were so many good options but I got the Seafood Linguini and I would defiantly recommend it! And when your meal starts with a bread bar, is there anything better? Try it out. Second Cup Coffee Co – We had breakfast here one morning and it was my favorite of the coffee shops we stopped at. They had a build your own oatmeal bowl which was awesome. It looks like this is a Canadian chain and you have options all across Canada. Cows – Apparently people in Banff take their ice cream very seriously. We were hoping to go to Cows since that’s what we had read the most about. Our overly opinionated taxi driver on our first night in Banff told us not to waste our time, that its over rated and somewhere else was better. I honestly don’t even remember where he recommended because a few other locals we talked to basically told us he was nuts and Cows is the best, and they did not disappoint. Go to Cows. If there’s a line, wait in it. It’s worth it. The Grizzly House – We had to take a pretty late reservation to get into this popular restaurant on a Friday night, but it was well worth the wait. We opted for the Four Course Fondue meals but we bartered with our server. None of us are big dessert girls so he let us trade our dessert course for both appetizers. We started with the soup and then had the cheese and garlic fondue with bread to dip and veggies boiled in a delicious oil broth that was out of this world. For our dinner course we were each able to pick what type of meat combo we wanted. We got the Original Fondue dinner (beef and chicken), Hunter Fondue Dinner (wild boar, buffalo and venison), and their Seafood Special Fondue dinner (lobster, prawn and scallops). Our server set us up with hot rocks to grill on and oil fondue and told us which meat is better to be cooked. The Grizzly House is definitely not somewhere to miss. Make a reservation and go hungry because you will leave full and unbuttoning your pants. In Banff we ended up opting for an AirBnB, mostly because there were very little options. We started looking for lodging only a month before we went on our trip. I thought that’d be plenty of time but it wasn’t at all. Our options were either stay for at a hotel on Banff Ave for a crazy amount of money each night, or stay in the Tunnel Mountain area of town, which was a pretty good location and just a quick 5 minute cab ride from town. Protip: There are no Ubers in Banff so you have to rely on local cabs. This really only was a problem once we were in town and couldn’t call a cab from our phones because we were using WiFi. But we were always able to find someone to lend us their phone so it wasn’t too bad. There are a ton of hotels right in town, and they probably would have been a little more convenient then our AirBnB but you need to book early for availability. While we were looking for accommodations we were actually getting a little nervous because campgrounds were the only thing that was coming up for a while, and lets be real, that wasn’t going to happen. After spending our first night in Calgary, we got on the road the next morning and headed west. We really wanted to explore the Icefields Parkway but new we may be pushing it since Icefield Centre is about three and a half hours from Calgary. We made a quick stop in Lake Louise and stopped into the Experience Lake Louise shop where we got a Driving Guide of the Icefields Parkway. It was just what we needed for our exploration. We drove straight to Columbia Icefields Discovery Centre in Jasper National Park. Here is where you pick up the busses to go drive out on Athabasca Glacier, visit the Glacier Skywalk, and view beautiful mountain peaks of the Canadian Rockies and the glaciers that have formed over time. The girl at the shop in Lake Louise recommended us pass right by the skywalk and visit Tangle Waterfall. It was a quick turn off on the left but it was a beautiful little stop and I am so thankful she let us know about it. We decided to just do the Glacier Skywalk and at first, I was a little nervous about it. I’m not a big heights person, as you know if you’ve been around here for a little bit. But I have been trying to push myself out of my comfort zone and went full force into checking the skywalk out. It was beautiful. Hanging 918 feet above the canyon, you get some insane views that you just can’t see from the side of the road. We didn’t have to pre-purchase anything but get there early in the afternoon because they do stop tours pretty early. The closing time also is affected by the season. Once we got to Peyto it started snowing and we started losing sun, so we decided to do the remaining stops later in our trip but here is where else we stopped. After our day exploring the Icefields Parkway, we spent the next day exploring Lake Louise itself. We started the morning with a hike…. A lonnnng hike. We took the Lake Agnes Trail up to the Lake Agnes Teahouse which was a 4.4 mile round trip hike. This teahouse has been around since the late 1800s and the building has no electricity or running water. We watched a staff member take water right from the lake and bring it inside. The hike itself took us a total of 4 hours to hike up to the teahouse, hang out for a little bit, fuel up with some snacks and hot cocoa, and then head back down. The trail is considered a moderate hike and while we were on it, some parts were really icey and slick since it had snowed a little that week. For me, someone who hasn’t hiked in a LONG time, it was pretty rough. It probably took us closer to two and a half hours to get to the tea house and just one hour to get back down. It was absolutely worth it. The day of, I would definitely not have said that, but looking back, it was worth it. Pro Tip: The teahouse is seasonal, and we actually were a little nervous that it had already closed because of the snow while we were there. Bring layers especially if you are hiking in the beginning or end of the season. (June or September) Also, its cash only once you get to the teahouse. Once we got down we headed straight over to the Lake Louise Canoes. Being in the travel industry, I have been wanting to visit Lake Louise for years, and canoeing was high up on my to-do list for this bucket list location. You can choose to take a canoe out for 30 minutes and only go to the center of the lake or go out for a full hour and go all the way across the lake. We chose the latter. The next day we headed over to Moraine Lake which is an absolute must see if you’re visiting this area. Rockpile trail, which is more like a leisurely walk, brings you to high up, panoramic views of the lake which are just stunning. Just like Lake Louise, Moraine Lake is made of glacier water, so the water is the most amazing pure blue you will ever see, and the higher you are, the more the blue stands out. We took the park ranger’s recommendation and did the hike to Consolation Lakes. This hike took us only about an hour and a half and was about 3 and a half miles round trip. Much easier than the Lake Agnes hike, there is really only one section that was a steady incline. The rest is pretty flat and easy, but once you get to the Lakes, make sure you have on the right shoes. I didn’t and I couldn’t climb over all of the boulders that separate the trail from the views of the lake. Pro Tip: Parking is very hard to get at Moraine Lake, which you probably have heard. We didn’t even try to park there, instead we parked at the free overflow lot right off of the Trans-Canada Highway and took a shuttle bus to the top. The shuttle comes every 15 minutes and was well worth the wait to not try to search for parking at the Lake. The last place we explored in Lake Louise was the Lake Louise Gondola. You take the Gondola from the Lake Louise Ski Resort. This is also seasonal since they use this lift for the resort during the winter. We took an open-air lift to the top of the mountain where we had lunch at the amazing Whitehorn Bistro. More on that later but the Lake Louise Gondola is a must do if you’re visiting this area. This was our final view of the amazing Lake Louise. Like I said earlier, Lake Louise has been a bucket list location for me for a while now, and not just visiting the National Park but staying at the Fairmont Chateau Lake Louise. Thanks to their partnership with travel agents, we scored a Fairmont Gold Lakeview Room on their club level. We got a private check in, a lounge for just club members that offered breakfast, and happy hour, and free canoe rides. Check, check, and check. This property was a dream. We checked in after it was dark, so we weren’t able to see our view, but in the morning, we woke up bright and early to make sure we had first dibs on the view of the lake. It was insane. But be warned, the fog comes in and out SO quickly. We got up, saw that the fog was starting to burn off so we ran down to take some pictures of the lake. Within 20 minutes the entire lake was covered again and you couldn’t see a thing. Patience is a virtue. Because of the hefty price tag at the Fairmont Chateau Lake Louise, we only spent one night there and night two we stayed right next door at Deer Lodge. Deer Lodge is owned and operated by Canadian Rocky Mountain Resorts, which is similar to the National Parks Service Lodges here in the U.S. Quite the difference from our AAA Four Diamond hotel the night before. At Deer Lodge we didn’t have a ton of restaurant options, or even a TV in our room so we went down to the liquor store in Lake Louise Village, grabbed some wine and watched Eat, Pray, Love on Netflix. In all honesty, the hotel was not bad at all, but there definitely were not thrills here. Alpine Social – Because we checked into the Fairmont Chateau Lake Louise so late there were only a few restaurants still open. We chose to sit at the bar at Alpine Social and it was pretty amazing. We started with sharing a bottle of wine and charcuterie board that they made specially for us since we were craving it. After we moved onto Stout and onion soup and seafood chowder, both absolutely amazing! We ordered another bottle of wine and each got another small app but really it was completely unnecessary (the food, not the wine). We had so much food it was just what we needed. Poppy Brasserie – In the morning, since we ran down to check out the lake, we opted out of our complimentary breakfast and instead stopped at the popular Poppy Brasserie. We fueled up with their breakfast buffet that had a fresh omelet station, oatmeal bar, waffles, fruits, cheeses, eggs, and cereals. We each had their freshly made smoothie and it was the perfect burst of energy for a long day of hiking. I highly recommend this restaurant if you are a breakfast person. Mount Fairview Dining Room – For our night at Deer Lodge we decided to try their restaurant and honestly, I am beyond glad we did. While the hotel may have underwhelmed, their restaurant more than made up for. We all started with (another) bottle of wine but this time decided to try a Canadian red. WOW! So good. Then we started our meals with bowls of mushroom soup to warm up and I had the Alberta beef ribeye with potatoes gratin. We all definitely needed a full meal after our picking dinner the night before and a long day of hiking. Trailhead Café – The next morning we were hoping back on the Icefields Parkway for some more sightseeing so we grabbed a quick, but hearty breakfast to go at Trailhead Café in Lake Louise Village. I took the server’s recommendation and added tzatziki sauce to my egg wrap and it was amazing. Defiantly different than the breakfast burritos I am used to but it was so good! This place is super small but a great place for a grab and go breakfast or lunch. Whitehorn Bistro – Whitehorn was high up on our list because we heard about the view, but once we got up there, wow the food was insane! Whitehorn Bistro is at the top of the mountain of Lake Louise Ski Resort. We took the gondola up and had an amazing lunch at the top. I had the shrimp and prawn ravioli and it was out of this world. Reliving this trip and the food we ate is making me want to go back! Later this week I’m going to be telling you guys about the last part of our trip in Banff. More food, more wine, less hiking. My type of trip. Happy Friday ya’ll! I’ve been back to work for almost two full weeks and I still find myself dreaming about our trip to Alberta, Canada with the fresh air, gorgeous blue lakes, and tree that soar higher than anything I’ve ever seen. Originally, I was going to tell you about the first part of my trip: Calgary and Lake Louise. But I had SO MUCH to write about I thought for your sanity, I’d split it into two different posts. To get to Banff National Park, your best bet is the fly into Calgary if you’re coming from the States. We got a car right from the airport. Super easy. We landed into Calgary late in the afternoon so instead of hoping into the car and taking a two-hour drive – after a propeller plane, a four-hour flight, and heading through customs – we spent our first night in Calgary. What we didn’t really think about, but night one was a Sunday. Calgary is a major city in Canada, but a major city in Canada is a little different then the major cities I’m used to here in the U.S. so we didn’t have a huge pick of restaurants and bars that were open, and we were ready to explore. We stayed at the Calgary Marriott Downtown Hotel right across the street from the Calgary Tower, thanks to Marriott’s amazing relationship with travel agents. Our room over looked 9th Ave and the tower itself. It was awesome. I really wanted to go up to the top to see the views of the city but it was super overcast and cloudy that first night so we opted out of the trip to the top and headed to a brewery that’s been in Calgary for over 20 years. WHAT! That’s insane! Wild Rose Brewery was a craft brewery before craft breweries were a thing. We each had a flight and split some of their amazing flat breads. It was the perfect quick dinner that we needed to wake up and get ready for our night out. We Ubered back into downtown Calgary and started at Last Best Brewing Company, which was recommended by our server at Wild Rose. Not really the vibe we were going for but this would be an awesome place for a group dinner on a Saturday night. On Sunday it was a little too, I’m going out alone and going to sit in the corner watching the TV for us. But they did have an awesome bartender who gave us some great recommendations for the rest of the night. He told us to head over to 17th Avenue and check out Living Room. We walked by a ton of other amazing restaurants and bars that look like on a Friday or Saturday night it would be wild. Living Room was so cute! We walked in and the bartender asked 3? I said yeah and instantly there were three of their late-night specialties in front of us, the Shaft. Coffee, Kahlua, and a splash of skim milk is apparently what locals come in to get at the end of the night. It was just what we needed to end our night. Last week my road trip besties and I got home from an amazing road trip through the Canadian Rockies. Last year while we were driving across country we decided we needed to keep this road trip life going and check out our neighbors to the north. So this trip has really been a year in the making. Canada is a pretty easy international trip. There is no language barrier, their customs and manors are pretty similar to ours here in the US (they may be a little nicer though), and it’s not a terrible flight. But even though Canada is pretty easy, its not as simple as crossing a state boarder. There is still customs to go through, passports to be checked, and you are still a visitor in their country. Canada is pretty strict about entrance into their country. They will do a background check on you and if anything comes up, you will be turned away. It’s pretty insane and I didn’t really believe it until I had a client that had a DUI from 20 years ago be turned away at the border. Yikes. We are road tripping this week. Most international countries require a International Driver’s Permit, or an IDP, but Canada doesn’t. But they do require proof of insurance when renting a car. I brought my car insurance card just to show I was covered, otherwise they were going to make me buy Hertz’s insurance. Check with your insurance company to make sure your policy covers you outside of the United States. The first time I went to Canada I was 18 and I had no idea you’re supposed to tip a taxi driver, in the U.S. or Canada. I’m not sure if I ever really paid a taxi before that. But that man yelled at us three little 18 year olds and I will never forget it. Know the area’s tipping customs. A quick google search before you leave should suffice but I like to look at a Lonely Planet book before traveling to another country. They have an awesome survival guide at the back of all of their books that covers things just like this. In Canada things are pretty similar to America. And FYI, you should tip a taxi 10%-15%. Canada is pretty safe, but anytime you’re traveling, you should be prepared. I take pictures of my passport and drivers license and keep it in my DropBox. I keep my hotel confirmations and car rental agreements in there too and make sure someone at home has access to all the same information. Never keep your passport on you while traveling, lock it up in your hotel room, and always keep an extra credit card in your hotel safe. If your wallet gets lost or stolen while you’re traveling you will have the additional resources you need to get by. Last week I spent the entire week in Alberta, Canada exploring Banff National Park, Lake Louise, and bits of Jasper National Park and Yoho National Park. To say this trip was amazing would be an understatement. Anyone who’s been on Instagram in the past year or so has seen the amazing shots of girls in canoe in Lake Louise, or on top of the rock pile at Moraine Lake. We went and found some off the beaten path spots during our trip, but of coarse, had to keep in the oldies but goodies too. If you’re headed to Banff, here’s your insiders guide before you go of where to get the shot. A few I’ve already used on my own Insta feed. 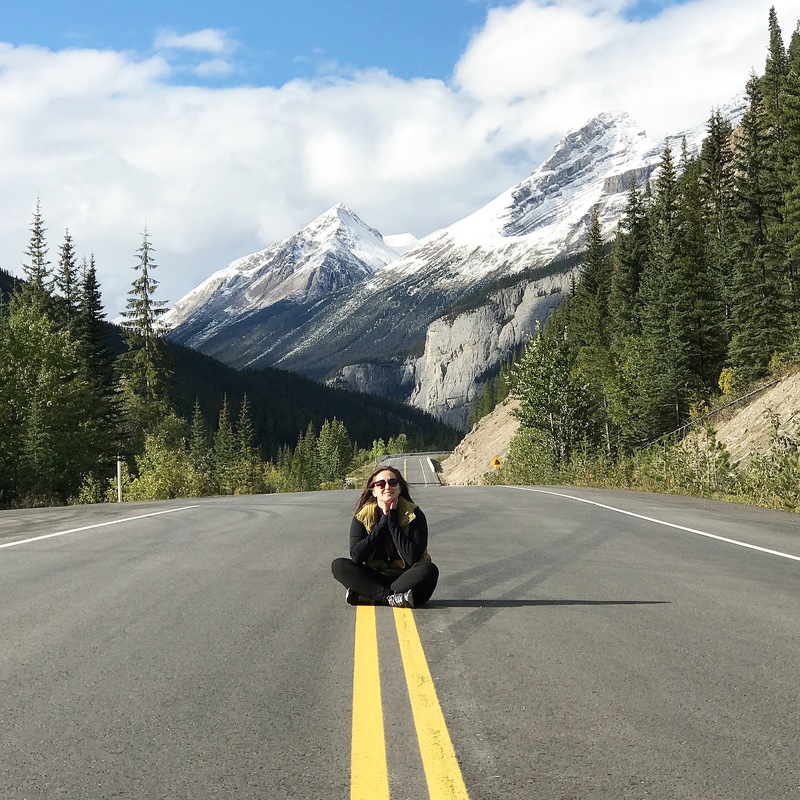 Icefields Parkway– This secluded highway has amazing views since you’re driving straight through the center of the Rockies. We pulled off to the side and would run out to the middle of the street to get these shots. It made it so much fun and the snow-capped mountains with bright blue skies are absolutely stunning. We were kind of on a curve in the road so we made sure we had someone watching behind the photographer to make sure we were being safe. But hey, you do what you got to do to get the shot, am I right? Waterfowl Lake– We did a lot of research on places to stop and check out along the Icefields Parkway but this was absolutely stunning and we ended up just stumbling upon it. Waterfowl Lake had so many places to take photos, sit on rocks, be on the lake bed. It definitely helped that we were there right at golden hour and the reflection of the mountains was a perfect mirror on the lake. Put this on your list. Lake Agnus Teahouse– It was a HAUL up, but the views from the top were absolutely amazing. The trailhead begins right at Lake Louise and you hike 4.2 km up. There are rocks, and ice, and it was rough, but once you get to the top, there are views everywhere you turn. The tea house itself is so cute and quaint. The lake at the top is gorgeous and flows down the mountain. If you hike up a little further, on Little Beehive Trail you can see views of Lake Louise and Mirror Lake. Lake Louise canoes– Pro tip: getting the quintessential cute photo, no life jacket looking like you’re the only one in the canoe shot is not the easiest. Go for a two-person canoe and then you have to row out pretty far. The lake isn’t that small. We did an hour canoe ride with three of us. The views of the glacier and the Fairmont are beyond anything you can imagine. Lake Moraine– This lake had the best coloring I’ve ever seen. The blue was brighter than even Lake Louise, and when we were there, there were just a few canoes out, but they looked amazing. You can take the short little walk up Rockpile Trail to see the lake from a higher vantage point. It is everything these photos say it is. And then this log. Can we talk about the log? A little slippery but once you out there, it’s defiantly worth it. Takakkaw Falls– Everything about this place was absolutely astonishing. We were here just as the leaves were starting to change colors, so the drive out to the falls was beautiful in itself. The road is much different than the highway or Icefields Parkway. The road is much smaller and it feels like you are driving through the tress. Once we got there, the small river that the falls lead into was gorgeous. The water was icy blue and there were so many places to get down into the water to get a great shot from a different angel. But what I loved the most about Takakkaw Falls was the view from the top. And this shot from the top of the rock, at the top of the falls was my favorite.